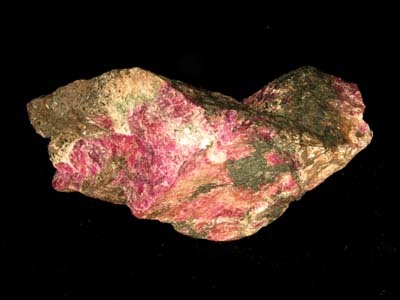 In a few cases, fluorescent minerals will exhibit tenebrescense (a temporary color change) after exposure to ultraviolet. One of the more dramatic examples can be seen in the sodalite (variety hackmanite) images above. This mineral is found in an area in the Illimaussaq complex in Greenland. The purple color appears after exposure to short wave ultraviolet. After a few minutes in normal light the purple colored areas will fade back to a greenish white as seen in the other image. Sodalite fluoresces a bright orange color under exposure to ultraviolet.